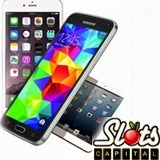 Mobile casino enthusiasts now have a new place to play with the launch of Slots Capital Mobile, featuring dozens of slots and table games from Rival Gaming. The brand new mobile casino offers real money play on iOS and Android, smartphone and tablet, so you can enjoy the array of games on a wide variety of different devices including the latest tablet models such as iPad Air. In addition, Slots Capital's original casino (slotscapital.lv), popular with players from all over the world has a new responsive website and lobby, and you can earn yourself a $7 free chip to try out either version by entering the coupon code FREESLOTS. There are dozens of great mobile slots and table games on offer, including progressive jackpot slots with huge prizes, and Slots Capital has a generous 277% casino welcome bonus for new players, up to a huge $2,777. With round-the-clock support and many different banking options, mobile casino players from around the globe have every incentive to try out Slots Capital Mobile Casino.